When both knees are going bad at the same time, what do you do? Well some individuals opt for doing Platelet Rich Plasma (PRP) at the same time, however some are cautious, not wanting two procedures at the same time. There are those who are interested in seeing the effect of the PRP, and having one knee serve as the control. An experiment if you will. This is the experience of the author with doing one knee PRP at a time. 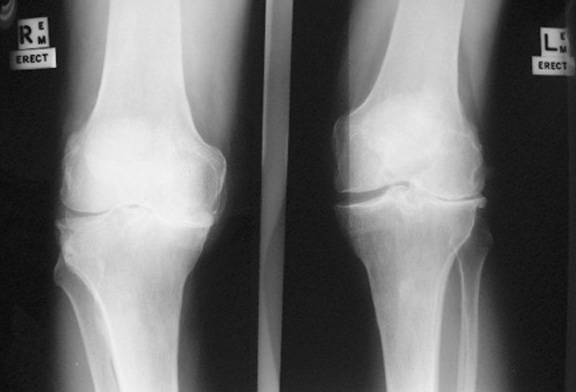 Both knees had been hurting for over a month, and were non-responsive to conservative measures. MRI scans were obtained for both knees and revealed early degenerative changes and effusions. One knee then underwent Platelet Rich Plasma (PRP) and the other served as the control per the patients request. Pain was not significant and ice was applied only briefly that evening and no medications were needed for pain. Walking was not restricted. The following day there was no pain, and work was as usual without problems. Following work gym activities were unaffected, however no knee training was done. Within a week there were no problems, and walking at a shopping area was done. This would normally trigger the knee complaints. The untreated knee became painful within a half hour. The PRP treated knee was non-painful. The author has elected to proceed with PRP treatment to the other knee. Note: not everyone responds the same to any treatment. This is an illustration of one case experience.